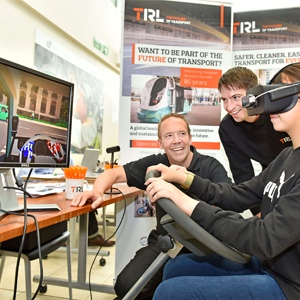 The global centre of innovation in transport and mobility, TRL, has developed a unique blind spot simulator rig which utilises virtual reality to help improve the design of truck cabs and road layouts, as well as aiding accident investigations. The simulator demonstrates TRL’s commitment to innovative technologies and its focus on safer transportation methods. The precision of the system is based on a physical rig developed and calibrated by TRL in collaboration with Volvo, to ensure a highly accurate representation of direct vision from a real-life Volvo vehicle cab. The calibrated rig allows all combinations of seat and steering wheel adjustments available in a real-life vehicle to be accurately replicated for each driver. The virtual reality experience is then reconfigured for each driver to reflect their unique physical dimensions and their individual seating positions. The resulting VR experience is an accurate replication of the view they would see when driving, as if they were in the actual vehicle. This approach stands in contrast to a traditional VR experience, where a camera is randomly placed within a scene in the hope that a rough representation of the vision is provided. Unfortunately, from the perspective of direct vision simulation, the variance between a rough and accurate representation may equate to the difference between seeing a cyclist or not. Ceki Erginbas, Senior Researcher at TRL, commented: “VR technology is increasingly being used throughout the industry to create immersive visual experiences. However, immersion or high-quality computer graphics does not necessarily mean accuracy. We wanted to take VR technology one step further than just a visually appealing experience, and create a scientific tool for virtual testing.